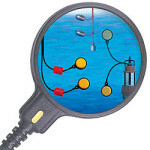 Categories: Flow Switches, Liquids, Marine Certified. Tags: Flow Switch, Thermal Dispersion, Thermal Flow Switch. The SP series is a thermal dispersion flow switch product line that responds to liquid flow and provides a switch output. 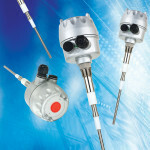 Based on the principle of heat transfer, the SP thermal dispersion flow switch consists of two temperature sensors. 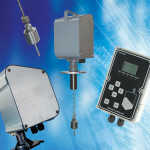 One temperature sensor is the reference and measures the temperature of the fluid where the thermal dispersion flow switch probe is immersed. The second temperature sensor is heated by the SP using constant power. 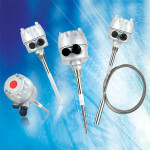 This creates a temperature difference between the two temperature sensors. As the flow rate of the fluid increases there is a cooling effect due to the fluid moving past the heated sensor. The more flow, the more the cooling. 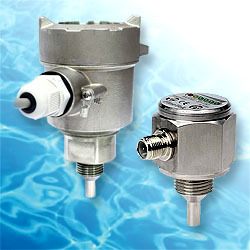 A reduction in temperature difference between the two temperature sensors indicates that the flow rate exceeds the user adjustable set point. When the flow rate drops there is less cooling, which causes an increase in the temperature difference. The SP series thermal dispersion flow switch is available in several versions with choices of lengths, materials of construction and output types to meet a wide range of application requirements..